Having undertaken to purchase this place [in Mount Helena] and paid the deposit, I came over here in January 1934 to start clearing. In these new properties, water is the first essential and although the flat was inundated with water in October 1933 (when I first saw it), in January 1934 it was as dry as the “Hobbs of Hell”. I thought of the advertisement: “Water at shallow depths …” So I started digging. For drinking water in the meantime, I lived on the very second-class water on a neighbouring property. I used a ladder made from timber out on the property and also a windlass with a clothes line wire and a four-gallon kerosene bucket. I used to fill the bucket, go up the ladder, empty it and start again. When it was seventeen feet deep, I went down to the local store at Mount Helena, then run by Mr Adams, and asked him if he knew anyone who wanted work. I would pay seven shillings (7/-) per day. He recommended me to Dave Powell. We worked all day eventually getting one bucket of water to four buckets of clay. We went then down twenty feet and had not put down any timber. I had already bought the timber in three foot and five foot lengths but it was not jagged. Dave said he would bring the ripsaw tomorrow and we would put down the timber according to the local well expert, a Mr Hobbs. When you strike water for every foot thereafter you will get that many feet of water. Well, he was wrong. Next morning when I went down to see the well it was three feet from the top of the ground and beautiful water. I threw may hat in the air and was as pleased as punch. No one who has always had water in plenty can imagine the jubilation of such a moment. So we just put a frame around the surface and left it at that. While I was in the army during the war the whole lot fell in and became a big water hole. Afterwards, I sunk it again with five foot by five foot timber and ten feet deep and there it still is today never less than one foot from the surface. Well, Stephanie, Kellie and Grant, you were all up here yesterday and your Mother and Father picked you up in the evening. Co is off colour this morning and is still in bed. While I was sinking the well referred to above, I got fed up with everything one day and went for a walk and found two young fellows, the Emmerson brothers, working away clearing. They had already got a well down. So I was able to go back with strength renewed! Today I am the only settler who originally took up land here in 1933. The first man to buy any of these blocks was a Mr Keith Howartson from Stoneville. 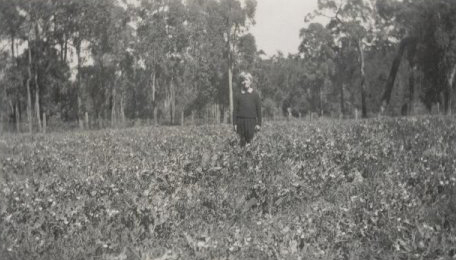 What was originally his property is now the Stoneville Research Station taken up by the Agriculture Department in conjunction with the Fruit Growers’ Association. When the war started in 1939, I had got two wells down and had the place fenced. George Emmerson and myself used to run a horse between us. We lost the first with York Road poison. You could pick up a horse in those days for £3 to £5 per head. When the war started, George and I joined the army. George got away before me and I was never in the same unit. 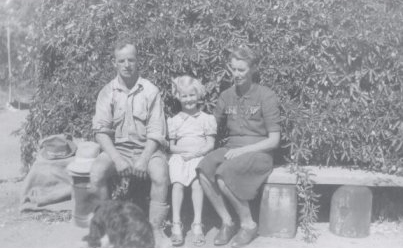 After we came back from the Middle East, I met Nancy (that is your grandmother) and we were married on 19 May 1942. Nancy was christened Agnes Marion Grieve, but as she disliked both her names she was known as Nancy. Yes, your grandmother was a marvellous person and came over here when Elizabeth was only a child and we did not even have a roof on the house. In the twenty-one years we were together, she helped me build up this property to what it is today: one of the best developed properties in the Hills. We sold half this place in 1969. Last year, 1973, after running 15-20 head of cattle all the year, we were able to harvest 514 of baled hay and 357 bales of meadow hay. 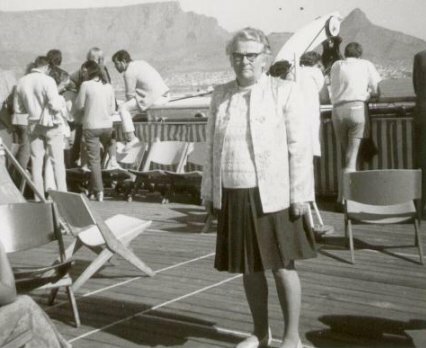 Your grandmother, Nancy, passed away on 30 July 1963; after only three days. It was a terrible shock to me. Your mother, Elizabeth, was then up at Derby Hospital as secretary. Nancy was very much loved by all who knew her. There were over ninety people at the funeral. Agranulocytosis [was the cause of death]. It is the opposite of Leukaemia [and is an acute condition involving a severe and dangerous leukopenia (reduction in the number of white blood cells) in the body]. For a man living on his own is just not natural. Nancy and I were together for twenty-one of the happiest years of my life. In August 1964, Co and I were married at the Presbyterian Church at Midland. At that time, Co had two sons still at home. Her eldest son, Gerald, had married in February of that year. And now you know them all. Bill Van Didden and his wife, Kerry, have two sons, Justin and Gareth. John and Chris Van Didden have three daughters, Leanne, Faye and Wendy. So you have any amount of cousins, uncles and aunts. John and Chris have Leanne, Faye and Wendy at 88 Ida Street, Bassendean (off Walter Road). Co and I sold half this Mount Helena property in November 1969 and in 1970 we went for a trip round the world. We were away seven months. 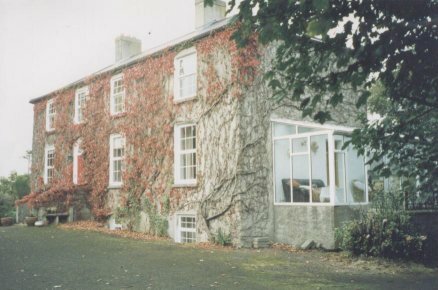 During that time, John and Chris lived here and looked after the place. [Co leased Lot 131 at Sawyers Valley] to John and Mary Gooding who loved being there. Your Grandmother’s family, as I have mentioned before, came from Glasgow, Scotland, and up to the time that we were away, the Estate (family estate) had not been finalised. The Grieve Trust was being administered by Haddow and McKay of 6 Woodside Crescent, Glasgow and at 12.00am on 14 September 1970 (Co rang up and was able to speak personally to Mr Snowden) we got an appointment. Mr Snowden was very helpful indeed and gave us all the particulars. The Estate (including the property and houses in the City of Glasgow) had been outstanding over fifty years but was finalised in 1971 when your mother received her portion of the Estate. Incidentally, the Grieve trust must have been very well handled indeed considering that the original Mr Grieve had eight sons. Before going to Scotland, we visited Ireland and the place where your Great Great Grandfather (my father) was brought up. Unlike the Glasgow affair, there was little or nothing left from the Castle Crine Estate. Everything happened long after I had left the country. At the time of my leaving England in December 1927, the Aunts’ Butler and “Puddie” (Anna and Henrietta) were in charge of Castle Crine, which was a going concern. Employing the best part of one hundred people with a Farm Manager, sometime during the last war [World War Two] the two Aunts above mentioned passed on and Castle Crine was put in charge of my Aunt Bee (Beatrice Graham, Dad’s sister) who moved herself (and as I understand) as much furniture to the Old Rectory at Kilkishen [as the Estate] was handed over to Cousin Zoe (now the Rt Hon. Mrs Butler Henderson). What they did with the place I do not know, but as I said earlier in this journal the whole place was demolished when we called there in September 1970. My Aunt Bee (Dad’s sister) who would be your Great Great Aunt passed away in 1956 and only three weeks afterwards, my brother, Alfy, passed away.